Tillerson comes to Moscow ready to play hardball. Photo: U.S. Secretary of State Rex takes off a plane on March 15, 2017. The U.S. Secretary of State will lay down an early marker of Washington’s stance in the Middle East and the Kremlin will probe numerous possibilities that the Lavrov-Tillerson meeting presents, despite tense environment. The U.S. Secretary of State’s visit to Moscow scheduled for April 11-12 may inspire little confidence but it’s generating big interest in Russia. 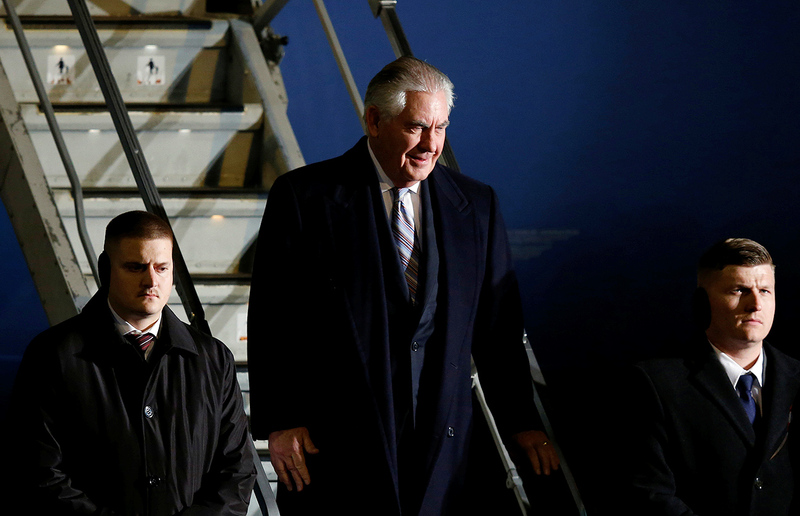 Experts aren’t expecting any major diplomatic breakthroughs during the talks between Rex Tillerson and Russian Foreign Minister Sergei Lavrov, but the trip is viewed as important nonetheless. Pundits believe Tillerson’s Moscow visit is an early attempt by Washington to clearly outline its position on pivotal international problems – in full view of the Kremlin. This might be harder said than done, given Lavrov and the U.S. Secretary of State are expected to put considerable pressure on each other during their meeting. There will be no love lost. "[For Americans] the purpose of this visit, most probably, is to test the waters," said Pavel Sharikov, head of the Center for Applied Research at the Institute for U.S. and Canadian Studies at the Russian Academy of Sciences and Valdai Discussion Club expert. "Everything that would not look like an obvious failure may be considered a success," said Andrei Kortunov, general director of the Russian International Affairs Council, stating that the primary objective for the two diplomats would be to evade a crisis in bilateral relations. Although experts warn against expecting deals between Russia and the U.S. – especially after Washington bombed the Syrian airbase, effectively shattering what many dubbed signs of normalization of Russia-U.S. relations – there is a genuine belief that even this doesn’t nullify the draft agenda of the talks. Strategic arms control, the non-proliferation of nuclear weapons, the Ukrainian crisis, North Korea, and relations with China are some of the issues the two sides are expected to thrash out. "[The U.S. strikes in Syria] adjusted the agenda of Russia-U.S. negotiations in terms of priorities, but not in terms of the topics that would be covered," said Dmitry Suslov, a professor at the Higher School of Economics and program director at the Valdai Discussion Club. Russia’s Foreign Minister Sergei Lavrov is therefore likely to use the meeting to outline in detail Moscow’s positions on the key areas of the country’s national interest. His American counterpart is widely expected to follow suit and explain to Lavrov in which direction the new U.S. administration sees Russia-U.S. relations heading. The sides are likely to ponder preliminary terms for either limited cooperation in some areas, or for mutually tolerable coexistence. Experts believe, however, that there remain a few areas where bilateral cooperation would benefit both Washington and Moscow. "It must be obvious for Russia that it’s impossible to solve global problems, be it terrorism or North Korea, without the U.S.," said Sharikov. The same applies to America as Russia progressively builds its great power status, becoming a stakeholder in virtually every major issue of world affairs. There’s no doubt that the Pentagon’s strikes against Syria has raised the stakes and heightened the tension surrounding Tillerson’s visit. Virtually all the experts RBTH spoke to said the bombing was a significant sobering factor, and the Kremlin’s approach to negotiations will be more cautious as a result. "The main question that Russia will seek an answer to during the current visit is whether the U.S. is returning to the policy of regime change, or was the strike an exception," said Suslov, arguing that the answer is key for the future of U.S.-Russia relations. In his turn, Tillerson – who once received the Order of Friendship from President Putin – comes to Moscow ready to play hardball. He reportedly seeks to "highlight Russia’s culpability" for the recent chemical attack in Syria to press the Kremlin into greater pliability. An antagonistic environment, triggered by the chemical attack and the following airstrikes, may easily cause a stalemate in bilateral relations and degrade potentially productive talks to a bare diplomatic courtesy. "Given the tenor of Tillerson's remarks in which he called for the ousting of Assad and basically blamed Russia for the chemical weapons attack, there is little reason to think anything positive might come of Tillerson's visit," said James Carden a contributing editor to The Nation, who previously served as an advisor to the U.S.-Russia Presidential Commission in the U.S. State Department. Yet a few optimistic voices remain in Russia, arguing that the very fact the meeting is taking place in current circumstances is a good sign. "Every man who understands the meaning of Russia-U.S. relations for international stability today and tomorrow must be interested in a successful outcome of the upcoming visit of the U.S. State Secretary to Russia," said Igor Ivanov, a Russian Minister of Foreign Affairs in 1998-2004. "I find it pointless to speculate about who will leave the negotiating table as a winner and who – as a loser." The former minister said the ultimate success of the talks will be measured by the diplomats’ ability to seal and officially announce the date for the much anticipated Putin-Trump meeting. "Until the normal political dialogue at the highest level is restored, it is not realistic to expect cooperation between [Russian and American] politicians and the militaries to be effective," said Ivanov.